A beautiful made in Israel woven wax wire bracelet in dark grey. This adjustable bracelet centerpiece is a uniquely designed Hamsa charm for protection and good luck. It is a comfortable, bright ornament. The Hamsa is made of Sterling Silver and there is a turquoise Swarovski crystal inlaid in the center of the Hamsa. 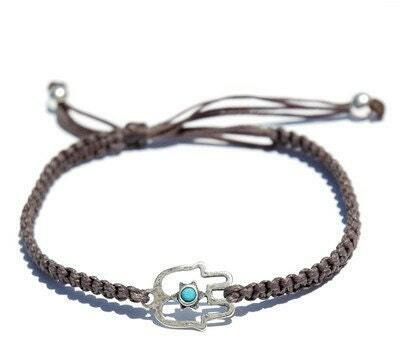 The Grey Hamsa Bracelet is adjustable for men or women.